Oh the lovely things: Spotlight : April421 - And a Giveaway! Spotlight : April421 - And a Giveaway! April421 is a lovely Etsy shop, filled with pretty fabric jewelry, wedding accessories, yarn wreaths, and more. Dianna, the sweet person behind it, creates every item by hand with time, care, love and attention to every little detail. And if you need one of a kind decor for your wedding, she can create the perfect wreath to use as ceremony or reception decor! You can also find April 421 on Facebook. Dianna is giving away a $25 store credit. The lucky winner can just pick their favorite items from April421! 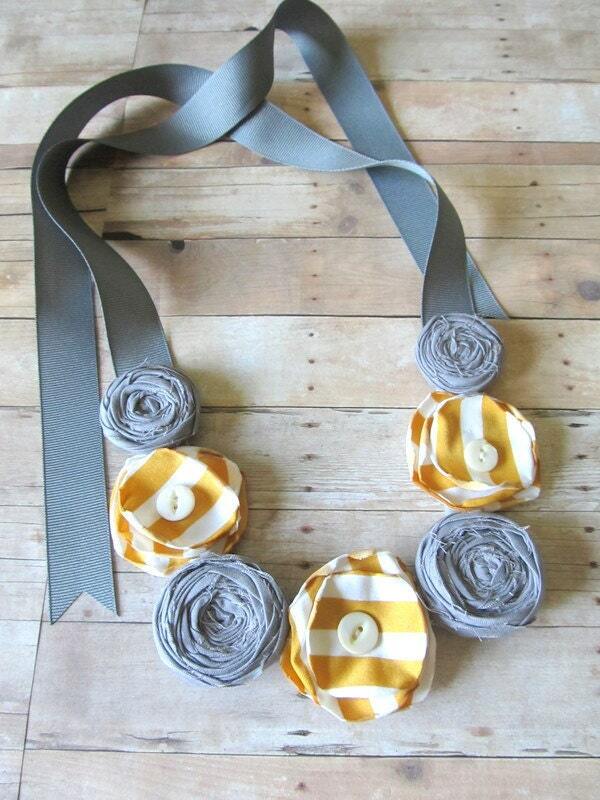 Mine is this Gray, Mustard and White Fabric Flower Necklace. This giveaway is now closed. The winner has been announced. Thank you so much for playing along! YOU HAVE UP TO 6 ENTRIES! Enter to win a $25 store credit! Please note : You are free to use as many (up to 6) or as few different entries as you want. If you use more than one way to enter, please leave a separate comment for each entry. If you win, we will need to contact you, so please make sure to leave your email address or any way to be contacted.This giveaway is open to all (worldwide). Visit April421, come back here and leave a comment letting us know which item is your favorite. Giveaway ends on Sunday, September 4th 2011 at 11:59pm EST time, and the winner will be randomly chosen using a random number generator. Thanks so much for playing along and best of luck to you all! My favorite item is LAYERED FLOWERS HEADBAND! and I just liked her facebook page! I love the Black and White Flower Hair Clip! I LOVE the grapewine wreath with felt flowers! I follow also on facebook. My favorite item is the Handmade Avocado Black and White Layered Satin Flower Ribbon Necklace!! Goodness, everything is so cute! But I do love the brown & white flower earrings! my favorite is the layered fabric flower necklace! so adorable with a simple white tank! I liked April421 on FB. I love the blue and white gingham flower earrings! Lovely! I also follow your blog. Regularly! the handmade black and white trio necklace?? hello? gorgeous! I liked April on facebook. I visited the shop, and my favorite item is the Handmade Grapevine Wreath that says "Love Thy Nest". Im a follower of ohtheloveythings! Love the Rosette Trio Headband Custom Made in blue! I like the Rustic Grapevine Wreath with HOME banner! I like April421 on facebook! Katy A.
Ohh, drooling over all those wreaths, especially the Grapevine Wreath with Felt Flowers! my favorite piece is the layered fabric flower necklace! I "Like" April421 on FB. I already follow Oh The Lovely Things by email. i liked april 421 on facebook as well! my favorite items from april 421 have definitely got to be the gray and white yarn wreath (for my new college home called the birdhouse!) and the satin layered flowers. SO CUTE! The yarn pom pom flowers are ahh-dorable! Definitely my fave - would love to make a garland out of them. LOVING the Headband Stretch Elastic with Trio of Fabric Flowers-could totally dress that up or down! It's so hard to pick a favorite but...I love her felt bow headband! My favorite item is the Fabric Flower and Lace Headband as it is classy yet can be worn in casual situations. I like the vintage inspired baby stretch lace headband. I love this Baby Stretch Lace Headband, adults would look equally sassy in this design! Already follow with gfc, thanks for the lovely giveaway. Oh so pretty!! Loving the chiffon Ruffle Fabric Flower Necklace. I love the Handmade Yarn Wreath with Colorful Bunting Banners. I like April421 on FB (Suzanne Gregg). I absolutely love all the headbands! I love the single flower rosette hair clip! I love the Single Rosette Flower Hair Clip! I love the Flower Statement Sash, cute! I love love LURVE the fall wreath with butterflies. It would be so wonderful for my red front door for Fall! Love, love, love those earrings they are so sweet! I love the black and white hair clip! So creative! I just blogged about April 421 on my blog at www.d-and-e.blogspot.com and uploaded the neat necklace picture. I just started following ohthelovelythings through subscribing to the mail inbox. Thanks. Yarn Wreath Handmade Halloween with Witch Hat is my favorite from the story. I'm also a follower of lovely things on my google reader! Love the black and white flower hair clip! I subscribe to oh the lovely things. I love the Chiffon Ruffle Fabric Flower Necklace. Would be perfect to dress up a simple tee. I love the fabric brown polka dot earrings! I liked april421 on facebook! My fav item is Ruffle Fabric Sash. I "Like" April421 on Facebook (Ana Belén R M). wowww! i love the wreaths - such a good idea.. but those yellow striped earings are just adorable! My favourite is the Layered Trio Necklace -beautiful!! I like the bow sash belt. I love the black and white hair clip. I am a hair stylist and I would rock this in my hair for work or as a broach ! Super cute! My favorite item is the Rosette Trio Headband. It's soooo beautiful! I "like" april421 on Facebook and in general ! I am a follower of this great blog and I'm duper excited I found it ! I love the Fabric Flower and Lace Headband. I love the Headband with Tulle and Buttons!! i love the necklaces! so.pretty. Omgsh, I LOVE the layered flowered headbands!! So adorable. Totally love your color choices in your designs!! My favorite item in the etsy shop will be: Handmade Yarn Wreath with Colorful Bunting Banners. All the flags and materials put together are just very cute! And of course, I totally liked April 421 on facebook! Everything is very pretty, but I love the Fabric Flower Statement Necklace. I like April421 on FB (Kimberly Fine Wright). I love the Handmade Fabric Rolled Rosette Necklace with Petite Bird! I like the Headband with Tulle and Buttons. I love her elastic stretch headband- adorable! My favorite is the Handmade Fabric Flower Grapevine Wreath. I love the Rosette Trio Headband Custom Made! I love the yarn wreaths! My favorite is the Handmade Americana Rustic Yarn Wreath! My favorite is the Rosette Trio Headband in Neutrals and White Fabric, but I love lots of other things, too. lol. I love the lace & satin necklace with the three white fabric flowers. I love the layered flowers headband! I love the ruffle fabric sash. 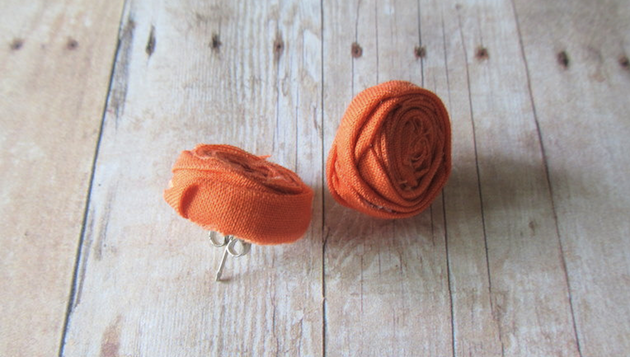 My favorites are the Orange Fabric Flower Earrings! I liked April421 on FB! My favorite is the handmade yarn wreath for a baby girl. I love the felt bow headband! I love Headband with Tulle and Buttons! I love her entire shop but having to pick a fave, definitely the Ready to Ship Layered Flowers Headband. Such lovely photos. I loved the handmade fabric flower bouquet! So cute. The layered flowers headband is my favorite!